From $ 324AUD per night We have direct contracts with most villa owners. We don't add any booking fees. We are 100% transparent with no nasty surprises. Perfect for a honeymoon or couples holiday - rent this now! 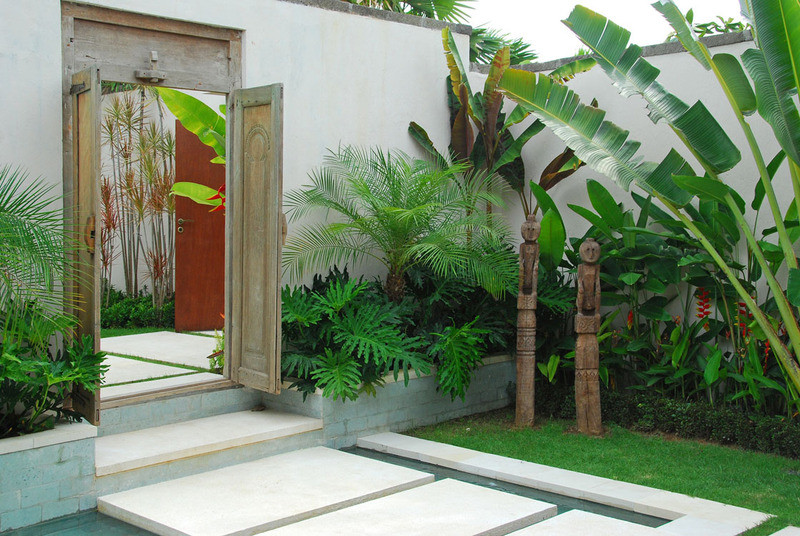 Villa Saba Arjuna is an intimate 1 bedroom Canggu villa holiday rental that’s simply perfect for couples wanting to have their own space & romantic experience in Canggu. Villa Saba Arjuna is a beautiful, private, luxurious and intimate villa that is just the right choice for a couple looking to experience the beautiful island amidst luxury, comfort and total bliss. 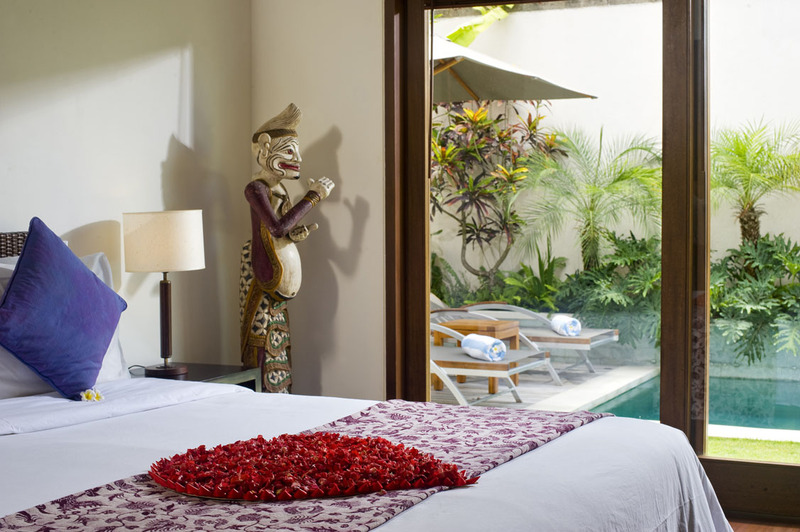 The villa is furnished with all modern facilities to ensure comfort and still retains its unique Balinese feel. 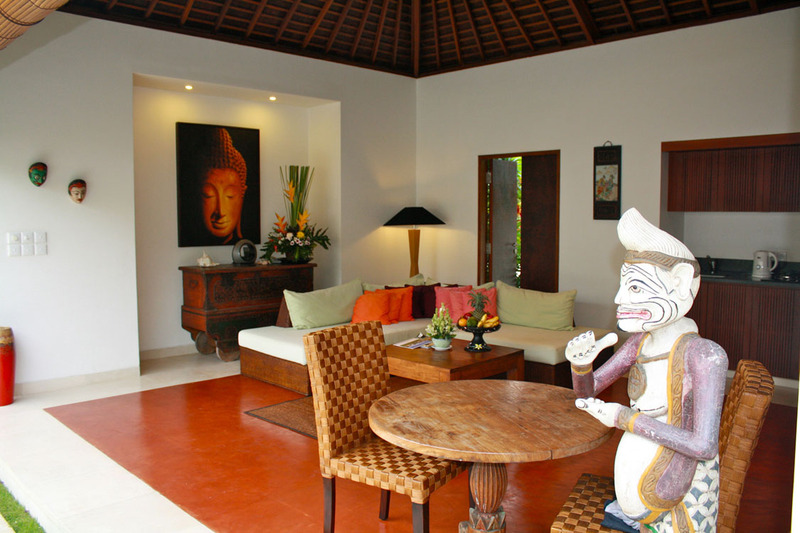 Villa Saba Arjuna is also very close to the several restaurants, cafes, bars, boutiques and beaches found in Canggu & the Berawa area. 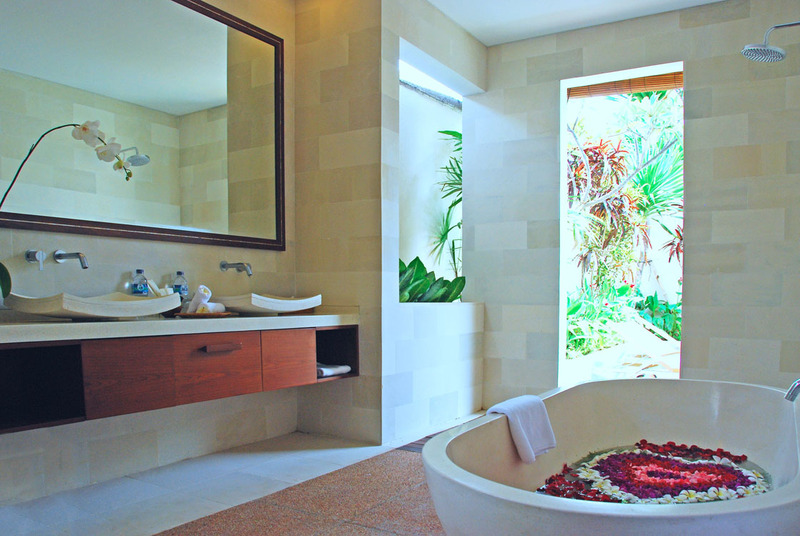 You and your partner are sure to have the best and most romantic villa escape when you stay at Villa Saba Arjuna. As you walk in through the gates of the villa, you enter a haven so serene and tranquil that you immediately feel relaxed. A concrete path leads you from the gate and right beside the gorgeous rectangular pool of the villa. On one end of the pool are sun loungers placed on the wooden deck. Here, you can enjoy sunbathing with your partner or just relax and cool off after a rigorous swim. 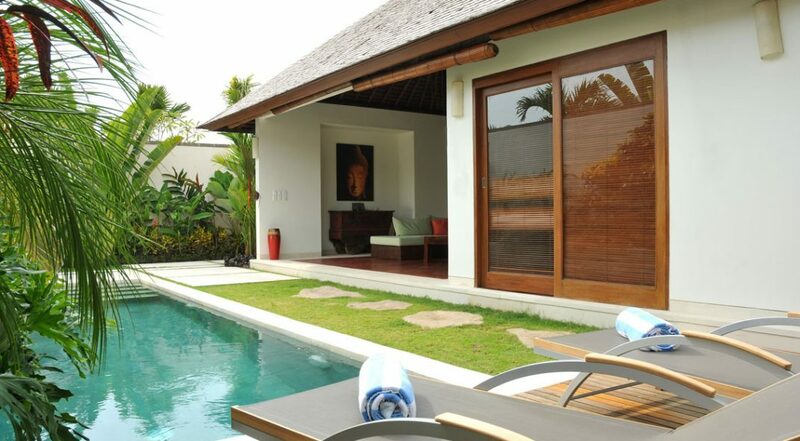 From the poolside, guests can see right into the lovely open plan living room of Villa Saba Arjuna. The décor is very traditional, with a lovely painting of Buddha hanging on the wall and a beautiful stone statue standing right in the room. There is a comfortable L shaped sofa set in the living room and right beside it is a lovely brown dining set for two. You can sit here and enjoy a delicious meal prepared by the seasoned chef of Villa Saba Arjuna. The bedroom of Villa Saba Arjuna is gorgeous, spacious, luxurious and super comfortable. 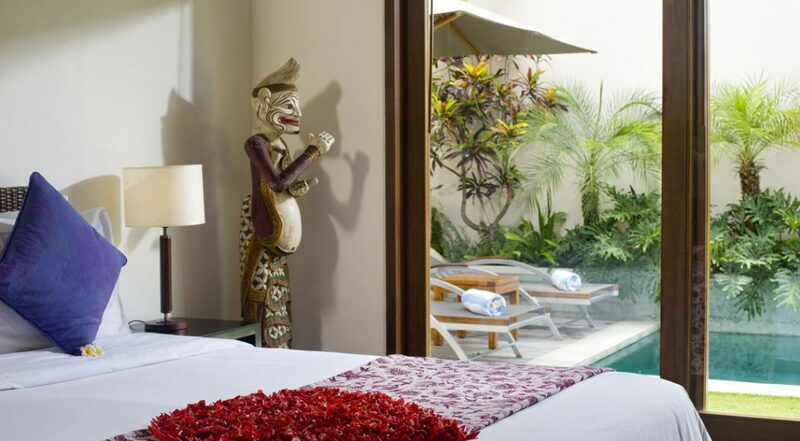 It is furnished with a comfortable king bed, flat screen TV and lovely pieces of Balinese art. A sliding glass door leads out to the wooden pool deck and another leads into the stunning bathroom. 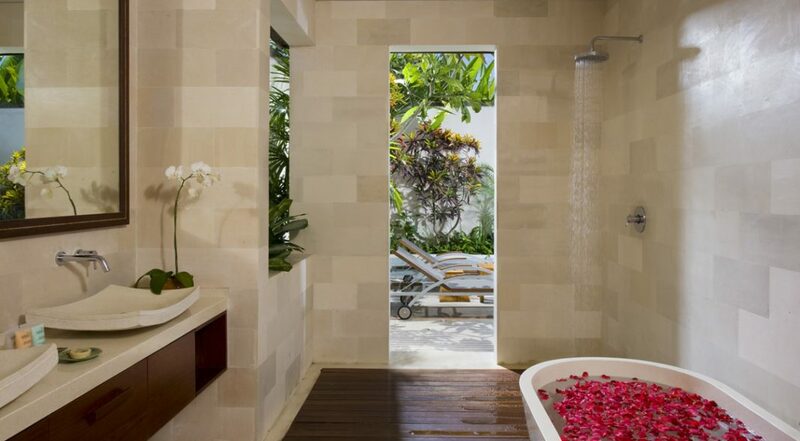 In the bathroom is a luxurious tub where guests can enjoy relaxing baths and a doorway leads out into the beautiful garden of the villa. 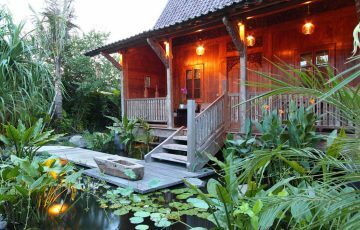 Villa Arjuna is made up of an open-sided living and dining pavilion that also has a very well stocked kitchen and a large bedroom. 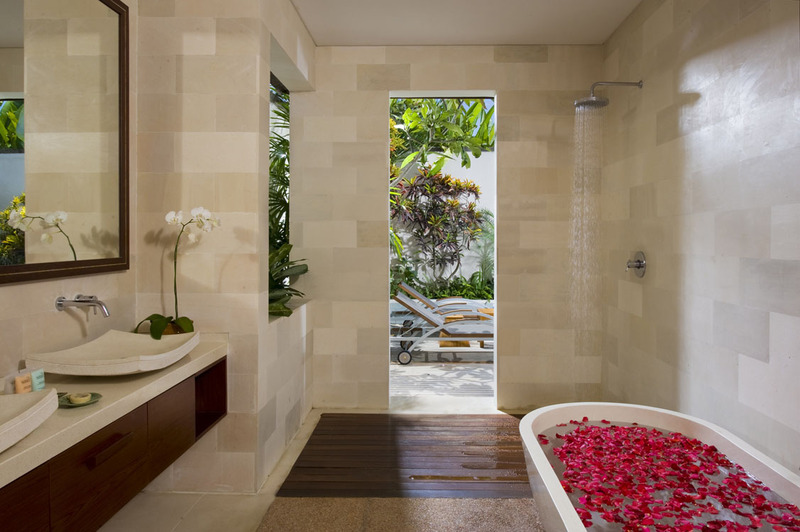 The bathroom is ensuite and is garden style. This is great for those warm tropical evenings where you can have a shower outside. There is also an 8 metre swimming pool and poolside chairs where you can lounge about and grab a sun tan. 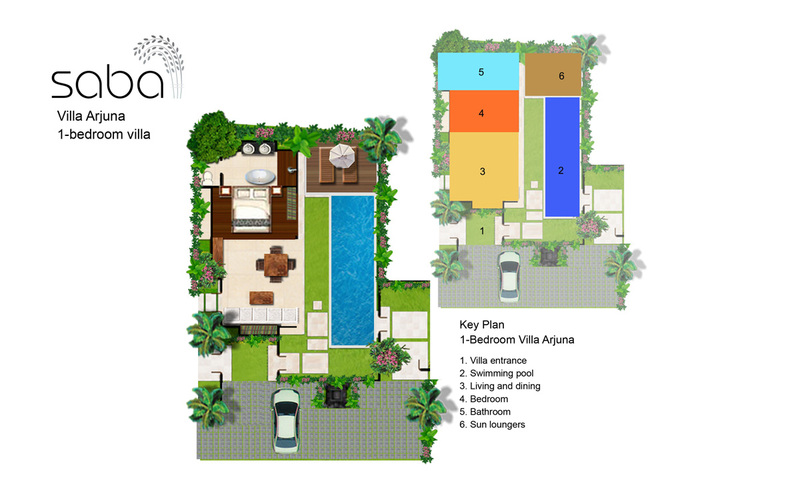 The great thing about Villa Arjuna is that it can also be connected to Villa Bima and/or Villa Nakula for groups requiring more space. Perfect for couples traveling together but wanting to go back to their own villa at the end of the day. The location of Villa Saba Arjuna is great if your coming here on your homeymoon or with your partner as there’s loads of cafes & restaurants all within walking distance. Try: Peleton, Milk & Madu, Lena’s Kitchen, Hungry Bird, Happy Chappy’s and head to Old Man’s and The Lawn for sunset drinks on the beach at Berawa. To view our full range of 1 bedroom Bali Villas or other romantic Canggu villas please browse this website or contact our reservation team. 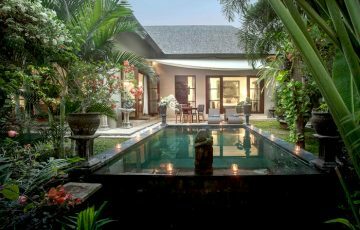 This is a really popular Canggu villa so if your planning a trip to Bali, especially during the Australian school or public holidays please book Villa Saba Arjuna well in advance. I spent a week here with my husband just to get away from everything and found this villa was the perfect solution. It was quiet, peaceful really intimate and above all we could get to the main area of Canggu easily when ever we wanted - this included the beach. Huge thx to the team at Bali Villa Escapes for picking us up at the airport and making us feel immediately at home - the staff at the villa were so pleasant that seeing them every day was a joy - we loved spending hours doing nothing by the pool and felt really calm here. Overall 10 out of 10! I was here last year for my honeymoon and we definitely had to come back to celebrate our one year anniversary. The villa was everything we needed to have a great time. We enjoyed dining in and the chef is definitely amazing. The facilities are great and everything was kept clean and tidy without much intrusion - there was a real sense of privacy here. My husband and I have fallen in love with this villa. We will be back again! Loved the location of the villa and the way we could get to restaurants - we rented a scooter so getting to the beach and those lovely cafes in Berawa was so quick. The villa was a real gem; chilled out and the swimming pool was perfect for the 2 of us. Truly a lovely experience. 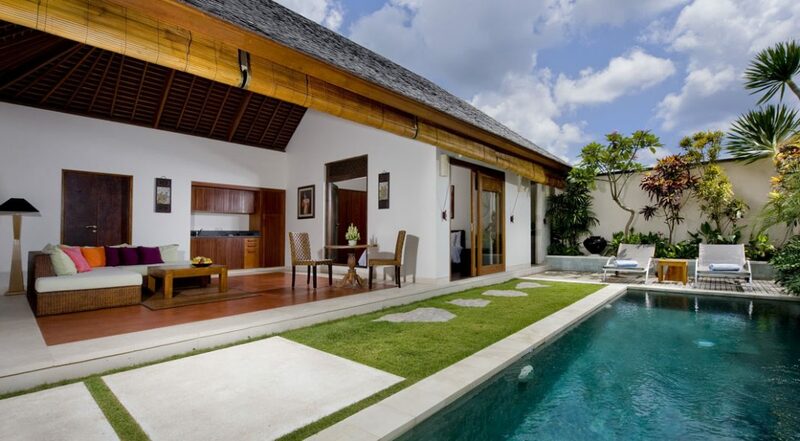 A wonderful villa that was just perfect for our Bali. We though we would try staying in a villa and were so glad we did. Private, laid back and good value. Near so many things to do. Fabulous times in a great villa. What a top location and so easy to book. Thanks guys for a top holiday.